The EU data retention bill, passed last year after much controversy and with implementation tabled for late 2007, obliges telephone operators and internet service providers to store information on who called who and who emailed who for at least six months. Under this law, investigators in any EU country, and most bizarrely even in the US, can access EU citizens’ data on phone calls, SMS messages, emails and instant messaging services. The European Union, led by potential future British Prime Minister John Reid, has also vowed to shut down "terrorists" who use the Internet to spread propaganda. The EU also recently proposed legislation that would prevent users from uploading any form of video without a license. ISP’s plan to restrict the Internet to a TV-like subscription model where users will be forced to pay to visit selected corporate websites by 2012, while others will be blocked, according to a leaked report. Despite some people dismissing the story as a hoax, the wider plan to kill the traditional Internet and replace it with a regulated and controlled Internet 2 is manifestly provable. "Bell Canada and TELUS (formerly owned by Verizon) employees officially confirm that by 2012 ISP’s all over the globe will reduce Internet access to a TV-like subscription model, only offering access to a small standard amount of commercial sites and require extra fees for every other site you visit. These ‘other’ sites would then lose all their exposure and eventually shut down, resulting in what could be seen as the end of the Internet," warns a report that has spread like wildfire across the web over the last few days. The article, which is accompanied by a You Tube clip, states that Time Magazine writer "Dylan Pattyn" has confirmed the information and is about to release a story - and that the move to effectively shut down the web could come as soon as 2010. People have raised questions about the report’s accuracy because the claims are not backed by another source, only the "promise" that a Time Magazine report is set to confirm the rumor. Until such a report emerges many have reserved judgment or outright dismissed the story as a hoax. What is documented, as the story underscores, is the fact that TELUS’ wireless web package allows only restricted pay-per-view access to a selection of corporate and news websites. This is the model that the post-2012 Internet would be based on. Whether the report is accurate or merely a crude hoax, there is a very real agenda to restrict, regulate and suffocate the free use of the Internet. The first steps in a move to charge for every e mail sent have already been taken. Under the pretext of eliminating spam, Bill Gates and other industry chieftains have proposed Internet users buy credit stamps which denote how many e mails they will be able to send. This of course is the death knell for political newsletters and mailing lists. The New York Times reported that "America Online and Yahoo, two of the world’s largest providers of e-mail accounts, are about to start using a system that gives preferential treatment to messages from companies that pay from 1/4 of a cent to a penny each to have them delivered. The senders must promise to contact only people who have agreed to receive their messages, or risk being blocked entirely." The first wave will simply attempt to price people out of using the conventional Internet and force people over to Internet 2, a state regulated hub where permission will need to be obtained directly from an FCC or government bureau to set up a website. The original Internet will then be turned into a mass surveillance database and marketing tool. The Nation magazine reported in 2006 that, "Verizon, Comcast, Bell South and other communications giants are developing strategies that would track and store information on our every move in cyberspace in a vast data-collection and marketing system, the scope of which could rival the National Security Agency. According to white papers now being circulated in the cable, telephone and telecommunications industries, those with the deepest pockets–corporations, special-interest groups and major advertisers–would get preferred treatment. Content from these providers would have first priority on our computer and television screens, while information seen as undesirable, such as peer-to-peer communications, could be relegated to a slow lane or simply shut out." Time magazine reported last year that researchers funded by the federal government want to shut down the internet and start over, citing the fact that at the moment there are loopholes in the system whereby users cannot be tracked and traced all the time. out mandatory ISP snooping on all US citizens by both Democrats and Republicans alike. strategy for "winning the war on terror" targets Internet conspiracy theories as a recruiting ground for terrorists and threatens to "diminish" their influence. the Internet and propagandize for the war on terror. In a speech last October, Homeland Security director Michael Chertoff identified the web as a "terror training camp," through which "disaffected people living in the United States" are developing "radical ideologies and potentially violent skills." His solution is "intelligence fusion centers," staffed by Homeland Security personnel which will go into operation next year. The U.S. Government wants to force bloggers and online grassroots activists to register and regularly report their activities to Congress. Criminal charges including a possible jail term of up to one year could be the punishment for non-compliance. A landmark legal case on behalf of the Recording Industry Association of America and other global trade organizations seeks to criminalize all Internet file sharing of any kind as copyright infringement, effectively shutting down the world wide web - and their argument is supported by the U.S. government. A landmark legal ruling in Sydney goes further than ever before in setting the trap door for the destruction of the Internet as we know it and the end of alternative news websites and blogs by creating the precedent that simply linking to other websites is breach of copyright and piracy. The US government is also funding research into social networking sites and how to gather and store personal data published on them, according to the New Scientist magazine. "At the same time, US lawmakers are attempting to force the social networking sites themselves to control the amount and kind of information that people, particularly children, can put on the sites." The development of a new form of internet with new regulations is also designed to create an online caste system whereby the old internet hubs would be allowed to break down and die, forcing people to use the new taxable, censored and regulated world wide web. Make no mistake, the internet, one of the greatest outposts of free speech ever created is under constant attack by powerful people who cannot operate within a society where information flows freely and unhindered. Both American and European moves mimic stories we hear every week out of state controlled Communist China, where the internet is strictly regulated and virtually exists as its own entity away from the rest of the web. the free world wide web.WATCH ALEX JONES’ ENDGAME ONLINE NOW in its entirety. Lessig also revealed there is already in existence a cyber equivalent of the Patriot Act waiting for a cyber terrorism event in order to implement its provisions. Lawrence Lessig, a respected Law Professor from Stanford University told an audience at this years Fortune’s Brainstorm Tech conference in Half Moon Bay, California, that “There’s going to be an i-9/11 event” which will act as a catalyst for a radical reworking of the law pertaining to the internet. Lessig also revealed that he had learned, during a dinner with former government Counter Terrorism Czar Richard Clarke, that there is already in existence a cyber equivalent of the Patriot Act, an “i-Patriot Act” if you will, and that the Justice Department is waiting for a cyber terrorism event in order to implement its provisions. There’s going to be an i-9/11 event. Which doesn’t necessarily mean an Al Qaeda attack, it means an event where the instability or the insecurity of the internet becomes manifest during a malicious event which then inspires the government into a response. You’ve got to remember that after 9/11 the government drew up the Patriot Act within 20 days and it was passed. Of course, the Patriot Act is filled with all sorts of insanity about changing the way civil rights are protected, or not protected in this instance. So I was having dinner with Richard Clarke and I asked him if there is an equivalent, is there an i-Patriot Act just sitting waiting for some substantial event as an excuse to radically change the way the internet works. He said “of course there is”. Lessig is the founder of Stanford Law School’s Center for Internet and Society. He is founding board member of Creative Commons and is a board member of the Electronic Frontier Foundation and of the Software Freedom Law Center. He is best known as a proponent of reduced legal restrictions on copyright, trademark and radio frequency spectrum, particularly in technology applications. The Patriot Act, as well as its lesser known follow up the Domestic Security Enhancement Act 2003, also known as USA Patriot Act II, have been universally decried by civil libertarians and Constitutional scholars from across the political spectrum. The Patriot Act was prepared way in advance of 9/11, awaiting an event to justify its implementation. In the days after the attacks it was passed in the House by a majority of 357 to 66. It passed the Senate by 98 to 1. Congressman Ron Paul (R-Tex) told the Washington Times that no member of Congress was even allowed to read the legislation. Now we discover that exactly the same freedom restricting legislation has already been prepared for the cyber world. An i-9/11, as described by Lawrence Lessig, would provide the perfect pretext to implement such restrictions in one swift motion, as well as provide the justification for relegating and eliminating specific content and information on the web. Such an event could come in the form of a major viral attack, the hacking of a major city’s security or transport systems, or some other vital systems, or a combination of all of these things. Considering the amount of unanswered questions regarding 9/11 and all the indications that it was a covert false flag operation, it isn’t hard to imagine such an event being played out in the cyber world. However, regardless of any i-9/11 or i-Patriot Act, there is already a coordinated effort to stem the reach and influence of the internet. We have tirelessly warned of this general movement to restrict, censor, control and eventually completely shut down the internet as we know it, thereby killing the last real vestige of free speech in the world today and eliminating the greatest communication and information tool ever conceived. Our governments have reams of legislation penned to put clamps on the web as we know it. Legislation such as the PRO-IP Act of 2007: H.R. 4279, that would create an IP czar at the Department of Justice and the Intellectual Property Enforcement Act of 2007: S. 522, which would create an entire ‘Intellectual Property Enforcement Network’. These are just two examples. Some of these major tech companies have already joined efforts in projects such as the Information Card Foundation, which has proposed the creation of a system of internet ID cards that will be required for internet access. Of course, such a system would give those involved the ability to track and control user activity much more effectively. This is just one example. In addition, as we reported yesterday, major transportation hubs like St. Pancras International, as well as libraries, big businesses, hospitals and other public outlets that offer wi-fi Internet, are blacklisting alternative news websites and making them completely inaccessible to their users. These precedents are merely the first indication of what is planned for the Internet over the next 5-10 years, with the traditional web becoming little more than a vast spy database that catalogues people’s every activity and bombards them with commercials, while those who comply with centralized control and regulation of content will be free to enjoy the new super-fast Internet 2. Now is the time to take risks to fight for your freedom. isnt it better to risk evrything rather than live life as a corporate slave? Something every 9/11 Truth campaigner should now be doing. 1. Get on the telephone and get to know one local and one national journalist by identifying two you think should be approachable. Be persistant, get direct and newsdesk numbers in case you have to call out of office hours. This is of utmost urgency We need to make as many peole aware of this in the media etc. not just in britain but the rest of the world. And we have to plan how to survive without the internet in case this happens. anyone with money to spare, try to place large page advert in local and national papers about the war on the freedom of speech on the internet? "On weekly basis we receive e mails from across the US and the UK from people who have attempted to visit our websites yet found them to be blocked by filtration software that lists them as "hate" or "violence""
This precedent is merely the first indication of what is planned for the Internet over the next 5-10 years, with the traditional web becoming little more than a vast spy database that catalogues people's every activity and bombards them with commercials, while those who comply with centralized control and regulation of content will be free to enjoy the new super-fast Internet 2, where DVD quality movies can be downloaded in seconds, but at the cost of the Internet losing its role as the last true outpost of freedom of speech. The necessity to warn people of this agenda is no more pressing than now, and this is why we are launching a contest to create the most powerful video presentation detailing the growing cancer of Internet censorship. Business minister Peter Mandelson has reiterated the government's 'three strikes' proposals to disconnect suspected copyright infringers from the internet, drawing sharp criticism from the UK's biggest ISP. Speaking at a cabinet creative industries conference on Wednesday, Lord Mandelson said anti-piracy proposals made in August will form the basis of the Digital Economy Bill, expected to go before parliament in late November. Tomorrow morning vampiric Lord Mandelson will present the Digital Economy Bill to the public, which among other things is aimed at reducing illicit file-sharing. According to parts of the bill that leaked today, the legislation could lead to jail terms for file-sharers and unprecedented power for the entertainment industries. Over the past months the UK government has tried to tackle the issue of online piracy. This has resulted in a proposal from Lord Mandelson, who plans to disconnect alleged file sharers without any judicial process. Tomorrow the exact text of the bill is expected to be made public, but according to early reports, the legislation will open all doors for a digital police state where alleged pirates will be crucified by private companies. Judging from some of the plans that leaked earlier today, the endless lobbying efforts of the entertainment industry by anti-piracy outfits including IFPI and the BPI have definitely paid off. Cory Doctorow has the scoop on BoingBoing and he told TorrentFreak that the information comes from someone “very close to the Labour government” who he trusts implicitly. If accurate, the new legislation will be a disaster for the privacy of all Internet users while giving unprecedented powers to the entertainment industry. Under the new bill the Secretary of State would be able to pass secondary legislation without Parliamentary oversight in order to protect rights holders. The leaked information mainly shows that the Secretary of State will have the power to introduce all kinds of draconian measures without Parliamentary oversight. More details on concrete policy dealing with alleged file-sharers and the proposed three-strikes system have yet to be announced. Virgin Media will trial deep packet inspection technology to measure the level of illegal filesharing on its network, but plans not to tell the customers whose traffic will be examined. The system, CView, will be provided by Detica, a BAE subsidiary that specialises in large volume data collection and processing, and whose traditional customers are the intelligence agencies and law enforcement. The trial will cover about 40 per cent of Virgin Media's network, a spokesman said, but those involved will not be informed. "It would be counter-productive because it doesn't affect customers directly," he said. As long as we've still got legal file sharing who cares? Make your own content and destroy the msm. It is time. Looks quite serious to me. What does this mean for the makers of subsequent Loose Change's? The digital economy bill will become law before Parliament is dissolved at the beginning of April ahead of a likely general election in May, senior media industry figures believe. That will usher in controversial laws enabling rights owners to cut off or restrict internet access for users who download films and music illegally. The bill contains measures designed to combat piracy. If it becomes law it will compel internet service providers including Carphone Warehouse and Virgin Media to pass on information about persistent offenders to rights holders. It is currently in the House of Lords and about to get its third reading, when peers get the chance to table final amendments to the legislation. Bloggers could face high fines for libel under the new Leveson deal with exemplary damages imposed if they don't sign up to the new regulator, it was claimed on Tuesday. Kirsty Hughes, the chief executive of Index on Censorship, which campaigns for press freedom around the world, said it was a "sad day" for British democracy. "This will undoubtedly have a chilling effect on everyday people's web use," she said. She said she feared thousands of websites could fall under the definition of a "relevant publisher" according to the rules passed in the House of Commons on Monday night as part of the courts bill. Under the rules, sites that generate news and are written by several authors could risk exemplary damages. Hughes said: "Bloggers could find themselves subject to exemplary damages, due to the fact that they were not part of a regulator that was not intended for them in the first place." Exemplary damages and costs imposed by a court to penalise those who remained outside the regulator could run to hundreds of thousands of pounds, enough to close down smaller publishers. Harry Cole, one of the journalists involved in Guido Fawkes, said it would not be joining the regulator and believes that because its servers are based in the US it will be excluded from the exemplary damages clauses. "I don't see I should join a regulator. This country has had a free press for the last 300 years, that has been irreverent and rude as my website is and holding public officials to account. We as a matter of principle will be opposing any regulator especially one set up and accountable to politicians we write about every day," he told BBC Radio 4's Today programme. Carla Buzasi, the editor-in-chief of The Huffington Post told the BBC: "I can't imagine any politician has had this discussion because they have rushed this through so quickly. "It does worry me to a certain extent. Someone said this is a carrot and stick approach. There doesn't seem to be too much of a carrot here," she added. The exemplary damages clause was recommended in the Leveson report but has been opposed by newspapers, including the Guardian, which have been given legal advice that it could be contrary to the European convention on human rights, which enshrines the principle of free speech. Lord Lester, the campaigner for libel reform, warned during the Leveson debate in the House of Lords earlier this year that publications such as Private Eye and local newspapers could face closure as a result of the imposition of exemplary damages. On Monday night, the editor of the Guardian, Alan Rusbridger said he welcomed cross-party agreement on press regulation, but said: "We retain grave reservations about the proposed legislation on exemplary damages." Under sustained questioning on Monday night during the Commons debate about the courts bill, which includes the Leveson regulations, the culture secretary, Maria Miller, said the "publisher would have to meet the three tests of whether the publication is publishing news-related material in the course of a business, whether their material is written by a range of authors – this would exclude a one-man band or a single blogger – and whether that material is subject to editorial control". Miller said the new rules were designed to protect "small-scale bloggers" and to "ensure that the publishers of special interest, hobby and trade titles such as the Angling Times and the wine magazine Decanter are not caught in the regime", but Hello! magazine would be subject to regulation. She said the "one-man band or a single blogger" would not be affected by the legislation because of the definition of "relevant publisher" in relation to exemplary damages. Miller said "student and not-for-profit community newspapers" will not be caught under the new rules and that "scientific journals, periodicals and book publishers will also be left outside the definition and therefore not exposed to the exemplary damages and costs regime". There was also confusion about which magazines would come under the remit of the new regulatory body. Miller said scientific journals would fall outside its scope, but the British Medical Journal, for example, is currently regulated by the Press Complaints Commission. Sunny Hundal, editor of the Liberal Conspiracy blog, said he didn't see a cause for panic. "There's a danger we miss the wood for the trees, as bloggers can already face big fines for libel. I'm fairly confident the eventual body will differentiate between Guardian.co.uk and independent bloggers. Trying to regulate the latter, even Leveson admitted in his final report, would be a step too far. "The key will be to differentiate between huge operations such as Huffington Post and voluntary blogs like Liberal Conspiracy. We should be vigilant but I don't see a cause for panic yet." Pressure group Hacked Off is refusing to reveal who is bankrolling their campaigns despite wanting more transparency in the press. They refused to comment on claims that rich benefactors keen on greater media regulation were covering the costs of the group, which is supported by celebrities including Hugh Grant. Blogger Guido Fawkes claims that donors include various peers, hairdresser John Frieda and BBC star Jeremy Clarkson, who is alleged to have made a £1,000 payment to Hacked Off. But Mr Clarkson denied this on this Twitter yesterday. After pressure from campaigners all political parties must declare donations of more than £5,000, but Hacked Off appears unwilling to do the same. The group has supported the parents of Milly Dowler and Madeleine McCann from press intrusion. A Press backlash against the Government's plan for a media watchdog underpinned in law intensified today as it emerged that the internet will be targeted for the first time. The draft version of the document suggests that foreign-based or owned websites such as Twitter, Huffington Post, Facebook, Holy Moly, the Guido Fawkes political site and even The New York Times will be subject to the stifling controls if their articles are aimed at 'an audience in the UK'. But as confusion mounted about exactly who would be covered, the government said it would leave it entirely up to the new regulator to decide whether major foreign sites should be made to sign up. There was also a growing backlash from the Press with Financial Editor Lionel Barber attacking the plans as a 'horse traders' ball'. The Spectator also formally rejected the scheme, releasing a front pages that said 'No', and The Daily Telegraph's deputy editor called for a breakaway regulator to be launched. But the greatest confusion surrounded rules governing the internet. The government claimed that 'small bloggers' would not be caught in the plan - but admitted this was still not decided. Lawyers say large foreign organisations could, like newspapers, be pursued for 'exemplary' damages of up to £1million in defamation and other cases if they failed to abide by its rules - even if they have their business or servers in other countries like America and Ireland. Even if they won a libel case in the High Court they could also be blocked from claiming back any legal costs under the proposed rules, meaning these huge financial penalties could be an incentive for them to sign up. The document says: 'The new rules would cover newspapers, magazines and websites containing "news-related material", even if the websites are not connected to a printed paper or journal. The Royal Charter also states that it will cover 'news-related material' including current affairs news and information, opinion and 'gossip about celebrities, other public figures and other persons in the news'. Kirsty Hughes, the chief executive of Index on Censorship said: 'This will undoubtedly have a chilling effect on everyday people's web use,' she said. Meanwhile there were clear indications that the many members of Press may not sign up to the scheme. Spectator editor Fraser Nelson tweeted a picture this week's front page and said he would be facing huge fines rather than sign up to the deal. Financial Times editor Lionel Barber described the way the plan was agreed in late-night talks between the political parties and Hacked Off as a 'horse traders' ball' and said his newspaper had yet to decide whether it would sign up to the new arrangements. 'This has not been a satisfactory process. We have not decided at the Financial Times whether we are going to join up with the new regulator. We will be looking at the practical implications and, above all, what has been completely lost in this process, the cost,' he told BBC Radio 4's The World At One. The Telegraph's Benedict Brogan wrote: 'The biggest newspaper groups put their heads together and agreed to think about it, but you don't need to be Mystic Meg to work out that the drift is towards rejection. For my part – and this is a personal view – I've concluded that we should note the outcome, thank the politicians for their engagement, and quietly but firmly decline to take part'. On the issue of internet governance, lawyers have said the wording is unclear and very wide-ranging. Niri Shan, Head of Media Law at Taylor Wessing, said: 'The wording of the Royal Charter is unclear and if I was Facebook or Twitter or Google I would be concerned about the lack of clarity. Mr Shan, one of the UK's top libel lawyers, said that media organisations based abroad have rarely ignored British libel judgements as damages would only be secured against their assets in the UK, like an office. 'If they did not have a British base they would still probably agree to pay damages and apologise because of the reputational damage it would cause them', he told MailOnline. This is despite American businesses being able to use the First Amendment - the right to free speech - as a defence. It also is despite U.S. courts will not enforce a UK libel judgment. It is understood that the same principle will apply, with UK courts left to decide if they have jurisdiction over the website and publication being sued. UKIP leader Nigel Farage said: 'The fact that in the proposed regulation all things and all people are covered, is very disturbing. 'That is your blog, your forum, your twitter feed, your Facebook page, in fact almost the whole of contemporary discourse. The only place left to speak out will be in the pub… and they are closing at 10 a week due to a series of ill thought out government measures'. Carla Buzasi, the editor-in-chief of The Huffington Post, which is run by U.S.-based company AOL, told the BBC: 'I can't imagine any politician has had this discussion because they have rushed this through so quickly. 'It does worry me to a certain extent. Someone said this is a carrot and stick approach. There doesn't seem to be too much of a carrot here,' she added. However, despite the language in the draft Charter, there remained political confusion last night as Downing Street said the regulatory regime was not aimed at bloggers, and giants like Facebook and Twitter. Adding to this lack of clarity, during an interview on Newsnight last night, Tory part co-chairman Grant Shapps said this was still not confirmed. The online editions of national and regional newspapers, such as the Guardian, Times, Mail and Sun, and the Dorset Echo, Somerset Standard and Yorkshire Post, would certainly be covered. Online-only edited ‘press-like’ content providers, such as the Huffington Post and lifestyle magazines including Heat, Closer and Marie Claire would also be included. Examples of those who would not fall under the potential remit of the new watchdog would be high profile Tweeters such as Stephen Fry, small publishers of special interest, hobby and trade titles, such as Waitrose magazine, Decanter, Retail Week, and not for profit community newspapers, such as Varsity, Leeds Student, parish magazines, scientific journals and periodicals like the British Medical Journal and the Modern Language Review. A spokesman said: 'Ultimately, it is a matter for the court to decide on the definition of a relevant publisher based on assessment of the facts, in accordance with the three interlocking tests. The spokesman added that the new system was aimed at tackling the 'British Press' and not the wider internet. 'It would be up to the self-regulator to devise their own rules. If they said "we will only accept publications that are based in the UK" that would be OK.
'In the Royal Charter and the exemplary damages that have been tabled there is nothing in there that says "this is only limited to UK publications". However there is nothing in there which says this should apply to overseas bodies. But hinting at the almost-impossible task of a UK body policing everything on online, the spokesman added: 'If we have got a regulator that decides it wants to do everyone, it will be a really big job. David Cameron, Ed Miliband and Nick Clegg yesterday unveiled a cross-party agreement on Press regulation after ‘shambolic’ all-night talks – only to see the deal immediately opposed by senior Tories and challenged by key elements of the newspaper industry. There was wider concern on the Tory benches at the chaotic nature of the discussions at which the deal was brokered. All three party leaders tried to claim victory after 20 months of wrangling in the wake of the phone hacking scandal ended in an agreement by the Prime Minister to set up a media watchdog. It would have the power to require front-page apologies and issue £1million fines, under a Royal Charter. The campaign group Hacked Off, which represents celebrities and other victims of Press intrusion and had four representatives at cross-party talks, warmly welcomed the deal. By contrast, there was no-one present at the early hours negotiations from the newspaper industry – which was not informed the talks were taking place. And last night there were doubts over whether major newspaper publishers would agree to recognise the new watchdog, while some Tory MPs warned it constituted a serious threat to three centuries of Press freedom. Four newspaper groups, the Daily Mail Group, News International, Northern and Shell, publishers of the Express, and the Telegraph Media Group, as well as the Newspaper Society and the Professional Publishers Association, said they had not been consulted over the final package and there were ‘deeply contentious issues’ to consider. The Newspaper Society represents 1,100 regional papers. London Mayor Boris Johnson, a former journalist, telephoned Mr Cameron yesterday and expressed ‘serious concern’ about a proposal to hit publishers who refuse to sign up to the new watchdog with ‘exemplary’ damages in libel cases. ‘The thing that is really exercising Boris is the idea that if we don’t join the club then you get whacked with massive fines,’ an ally said. Former Tory Cabinet minister Peter Lilley went further, telling MPs the new regulator would act as an Orwellian ‘Ministry of Truth’ and urging media organisations to follow the example of The Spectator magazine, which has indicated it will refuse to recognise the body. Mr Cameron pulled the plug on cross-party talks on Thursday, claiming Labour had produced fresh demands, apparently prepared in close co-operation with Hacked Off. But over the weekend, facing a Commons defeat as Labour and the Lib Dems threatened to join forces, the Prime Minister reopened discussions with Mr Clegg. His chief negotiator, Cabinet Office minister Oliver Letwin, was then dispatched to talks in Labour leader Ed Miliband’s office in the Commons on Sunday night. Four representatives of Hacked Off, which has campaigned for a draconian crackdown on media excesses, were present. A deal was finally reached at 2.30am yesterday. Downing Street denied that Mr Cameron had been asleep, insisting he had been in touch with Mr Letwin regularly throughout the night, with their last contact at 3.20am. Tory MPs expressed private amazement that the Government had allowed talks to take place in Mr Miliband’s office, or with Hacked Off present – but no-one from the media industry. In the Commons later the Prime Minister said a Press law had been avoided – although he conceded there were ‘two very important but relatively small legislative changes’ needed. They include a clause allowing more punitive libel damages to be awarded against publishers who refuse to recognise the watchdog. A separate clause was passed last night to ensure that the Royal Charter for the Press cannot be amended unless two-thirds of MPs and peers and all three main party leaders agree. Mr Cameron made a number of concessions to secure the deal, dropping an effective veto for the industry over the regulator’s membership and agreeing that the regulator should have the power to ‘direct’ newspapers on the prominence of apologies and corrections. A Labour MP yesterday demanded that the editor of the Sun be sacked after the newspaper paid damages for accessing a stolen mobile phone. Immigration spokesman Chris Bryant called for Dominic Mohan to quit after his reporters read messages from a mobile belonging to fellow Labour MP Siobhain McDonagh. The Sun accepted there had been ‘a serious misuse of Miss McDonagh’s private information’ after her phone was taken from her car in South-West London in October 2010. The Sun, which was not accused of stealing the phone, offered an unreserved apology and Miss McDonagh said she was paid £50,000 damages by News Corp.
After the hearing, Miss McDonagh said that she felt very uneasy after being told in 2012 that the paper had appeared to have ‘acquired her mobile phone’. The regulator was also given the power to appoint the committee which writes the Editor’s Code, dismantling the one part of the existing system that is agreed to work well. Mr Lilley said: ‘We are giving a body the right to decide what is fact and what is true. At worse, it is going to be establishing a sort of mini self-appointed Ministry of Truth. Conservative MP for Clacton Douglas Carswell said: ‘Today is a milestone. Press now answer to quangocrats. Awful, awful, awful. The MPs have produced a Press regulatory regime of fiendish complexity, with layer upon layer of bureaucracy. The process begins with the political parties themselves who, by devising the terms of yesterday’s Royal Charter, have interfered in the workings of the free Press for the first time in 300 years. As we show in the flowchart, the first step to be taken under the Charter they have produced will be the establishment of a Recognition Appointments Panel (shaded red, on the bottom right-hand side). Handpicked by ex-Whitehall mandarin Sir David Normington, the current Commissioner for Public Appointments, none of the four members can ever have been a newspaper editor. In turn, as the arrow on the diagram shows, this panel will then appoint a Recognition Panel. This will contain up to eight members, none of whom, the politicians have decided, can be an editor, publisher or a member of the Commons or Lords. Crucially, it will have sweeping powers to oversee the new independent Press regulator. The Recognition Panel will carry out regular checks on the regulator and will pass judgment on whether or not it is working. A negative verdict could take Westminster back to the drawing board. This brings us to the regulator itself – which, as we show in the boxes coloured blue, is being established under a separate, hugely complicated process. The first move in setting this up will be the establishment of a six-strong Foundation Group (bottom left) appointed by the newspaper industry and headed by ex-President of the Supreme Court Lord Phillips. The group’s job is solely to set up a Regulatory Appointments Panel, which will contain five members – an independent chairman, two other independent members, an editor and one other industry member. This Panel’s job is two-fold. 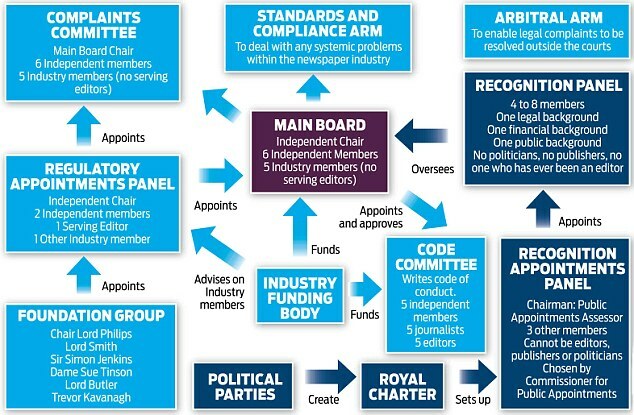 First, it must pick the 12 members of the Main Board (coloured purple) of the new Press regulator, which will be independently chaired with six other independent members. The five industry members on the Board – a minority – cannot include serving editors. The Panel will also establish the Complaints Committee, an off-shoot of the regulator containing the Main Board’s chairman, six independent members and five industry figures, none of whom can be a serving editor. The Complaints Committee will decide if the new Code on journalistic conduct and ethics has been breached in individual cases – which could lead to the Main Board ordering the publication of prominent apologies and corrections. Drawing up this new Code will require the establishment of yet another panel – the Code Committee – featuring five independent members, five journalists and five editors. It will be appointed by the Main Board, raising concerns that it will be acting as judge and jury on rules it has itself written. To this galaxy of committees will then be added two other new bodies, which are offshoots of the new regulator’s main board. The first, the Standards and Compliance Arm, will have the power to investigate potentially systemic problems at a newspaper, such as phone hacking, and impose huge fines. Meanwhile, the Arbitral Arm will set up a panel to adjudicate on civil complaints against newspapers, without the need to go to court. If a member of the public wins a case, the newspaper involved must pick up their costs. But, if the person loses, newspapers will not be able to recover their own legal fees – potentially leaving regional newspapers, in particular, with crippling bills. There are also concerns about the system being swamped by compensation-seekers. To get this Byzantine system of regulation off the ground will require countless meetings involving dozens of panel members and independent experts. The danger is that it will collapse under its own complexity. The Online Harms White Paper was released by the UK state today (08/04/2019.) The state claims that it is all about ‘keeping us safe’ online and especially keeping children safe online. Which is a very laudable objective. Who could argue with that? The problem is that the Online Harms White Paper effectively establishes the legal framework for the censorship of the Internet and takes a sledge hammer to any notion that we have free speech, or a democracy, in the UK. It is precisely the kind of proposed legislation you would expect to see from a dictatorship. If it passes into law, it will create one in the UK. No matter who you vote for. Before we I get carried away, it is worth mentioning that the Online Harms White Paper has already drawn criticism and a 12 week consultation period is proposed. However, by examining the content, the intent of the state is clear. It is that intent which I address here. When Orwell gave the world his much overused, dystopian nightmare of a people shackled to the authority of on overseeing, all powerful state, many gave thanks that they lived in a democracy. People in the West were both enthralled and horrified by his vision. They drew parallels with the perceived darkness lurking behind the Iron Curtain. But Orwell wasn’t describing life in the East, he was offering a terrifying vision of our future. It really is not hyperbole to say, with their Online Harms White Paper, that nightmare is being proposed, right now, by the British state. A white paper is a proposal of policy (legislation.) The Online Harms White Paper proposes the state rolls out rank censorship to control everything we say and do online. As usual, this draconian diktat is dressed up in fluffy language amid absurd claims about ensuring a ‘free, open’ Internet. Nothing could be further from the truth. The devil is always in the detail, and this devil is the Ministry of Truth. Not metaphorically, but actually. Firstly let’s accept what appears to be reasonable. The Online Harms White Paper does pretend to address some legitimate concerns. It spends a lot of time focusing upon the sharing of terrorist propaganda, the online grooming of children, the sharing of CSE images, the use of the internet to incite violence, to isolate and abuse, bully and harass vulnerable people, particularly children. It suggests ways to stop the online selling of illegal drugs, disrupt the coordination of criminal activity by street gangs, save people from suicide and even looks at ways to address excessive screen time to reduce the known health impacts. On the face of it there’s not much wrong with this. So this will be the claimed justification for pushing this legislation through. However those determined to commit violence and criminal acts will still do so. The Online Harms White Paper won’t even make them break their stride. Any idiot can figure that out. If the state was actually serious about tackling terrorism it would stop funding, arming, training and equipping terrorist; If it wanted to tackle child abuse it would fund proper investigations and genuine inquiries into historic and current exploitation, not do everything in its power to stop them. This despotic proposed legislation has nothing to do with protecting vulnerable children or tackling terrorism. It is expressly designed to silence any and all who criticise the state. Have absolutely no doubt, the Online Harms White Paper is an attempt to create a totalitarian censorship grid which will absolutely eradicate free speech and freedom of expression online. To illustrate the point, I won’t focus on the pretence. There’s much discussion within the Online Harms White Paper of what initially appears to be sensible. This is simply the sales pitch that state mouth pieces, like the MSM, will highlight ad nauseum. I leave them to carry out their work. Instead, let’s look at the reams of free speech censorship which really characterises this abomination. Section by section. Threats to national security are cited throughout the Online Harms White Paper as a primary concern of the state. People using the Internet are considered a threat. As a result the state has decided they need to stop people freely sharing information online. Used to unlawfully censor a BBC investigative documentary about the Zircon spy satellite. Used to unlawfully suppress the Guardian from discussing Peter Wright’s ‘Spycatcher’ revelations. Used to hide allegations of torture made by British special forces against U.S troops in Iraq. Used to unlawfully suppress media reports about the imprisonment of whistleblowers, who revealed the minutes of a private meeting between Bush and Blair, which led to allegations of war crimes in Falluja, Iraq. Used to unlawfully suppress revelations about the state torture of Binyam Mohamed. Now we’re getting to the meat and potatoes. This is what this malign legislative proposal is really about. The state is setting itself, and its ‘trusted stakeholder partners,’ as the arbiter of truth. The state will decide what’s true and what’s not. This is precisely the ‘Minstry of Truth’ Orwell implored us to resist. Please consider the implications of this statement. Of course it is right to censure those who incite violence of entice others to commit crime, we already have laws to do that, but the Online Harm White Paper decrees that the state will decide what is acceptable for you to say on the Internet. Even if it isn’t illegal. There is nothing in the Online Harms White Paper that defines what ‘harm’ is. In 1859 John Stuart Mill drew a clear distinction between ‘legitimate’ and ‘illegitimate’ harm. This proposed legislation makes no such distinction. Harm, is whatever the state says it is. Because this is a global initiative. There’s no escape. Combined with EU’s Internet censorship legislation there’s no doubt freedom of speech in Europe will soon be over. So it would be good to know what the definition of ‘harm’ is. That isn’t disclosed, so we have to question if it exists. •A free, open and secure internet. If true, the best thing to do would be to rigorously enforce the existing incitement laws which stop people promoting unlawful acts. The spurious suggestion that this legislation doesn’t destroy freedom of speech and expression takes hypocrisy to new levels. While shutting down freedom of speech and seizing control of the Internet, at the same time, undoubtedly in an attempt to distract attention away from this oppression, the British state was claiming on the world stage that it is the protector of press freedoms. A sickening irony. •Rules and norms for the internet that discourage harmful behaviour. •Citizens…..understand the risks of online activity, challenge unacceptable behaviours and know how to access help if they experience harm online, with children receiving extra protection. •A global coalition of countries all taking coordinated steps to keep their citizens safe online. Because it is all about the globalist’s vision of a one world government. As personified by the Rapid Response Mechanism, allowing G7 states to coordinate the official narrative of global events. As the MSM are completely state controlled, this legislation ensures any questioning of those narratives will be silenced. This is its purpose. This has nothing to do with tackling criminality. If it did, then it’s purpose would be to tackle activity that does cross the criminal threshold. But it’s not. It won’t work in the fight to stop genuine criminal, ‘legitimate harm.’ Do you think censoring YouTube, controlling search results, limiting social media shares or stopping people from sharing their thoughts and ideas online will deter terrorists or paedophiles? Will they just give up, because they can’t use Instagram? It is an absurd suggestion. The Online Harms White Paper does precisely ‘jack’ to tackle any of these problems. It adds nothing of any value at all to existing laws. Perhaps if the Police weren’t chronically underfunded by the state, they could be more rigorous in enforcing the laws we already have. This legislation is not about protecting people, it is about removing your right to free speech. Don’t be fooled into thinking otherwise. Here the state lays out what their regulatory framework will be. Throughout the Online Harms White Paper the state keeps banging on about the ‘independent regulator.’ Another sales pitch. The state will completely control the regulator. The creation of an online, privatised, corporate police state which will actively spy on everyone who uses the Internet. All are equal, but some chosen ‘partners’ (private corporations) are more equal than others. In other words, the entire Internet and everyone who uses it. Only the Internet giants and the MSM will be able to afford the technological demands brought into being with the Online Harms White Paper. The Internet is about to get a lot smaller. They could but they won’t, unless the state approves. It isn’t remotely independent. The Online Harm white Paper makes that abundantly clear. No it won’t. The state will. UKRI is an organ of the state which, under this legislation, will ensure the academic world stays ‘on message.’ Restricting academia and scientific endeavor only to that which is sanctioned by the state. Independent innovation and research, such as it still exists, is finally killed off by the Online Harms White Paper. Yes it will. The Online Harms White Paper makes sure of it. The state intends to train us to think properly. Here we see the impact of this censorship law. Working with their partners in the EU, because Brexit was just a charade, the Online Harms White Paper restricts Internet services only to those authorised by the state. The state will crush all who do not comply. The Internet is only for the state’s chosen partners. The duplicity in this statement is staggering. The technological costs of implementing all this will rule out any small to medium scale ‘start up’ businesses. The Internet will become the sole province of wealthy corporations. Which is the other reason for this power grab. The children are going to be indoctrinated by the state to accept nothing but ‘groupthink‘ and only to believe Newspeak. The evidence strongly suggests that Daesh is a creation of the Western deep state. The ‘problem’ the state is using to justify its dictatorship was almost certainly created by the state. The ‘upload filters’ are going to be prohibitively expensive to all but global corporations. The Online Harms White Paper dovetails neatly with the EU’s copyright directive which imposes the same requirements. This may explain the possible vote rigging which enabled the EU’s directive to pass. The state is assuming authority to define what ‘our way of life’ is, without consultation or discussion. While most of us probably believe that ‘our way of life’ is based upon freedom of speech and expression, clearly the state thinks otherwise. It appears ‘our way of life’ is another shape shifting concept to be defined by the state as it suits. This is the primary focus of the Online Harms White Paper. Over recent years the state has lost control of the narrative. Too many independent media outlets, foreign news agencies and independent researcher bloggers, like Robert Stuart, have been able to use the Internet to expose the genuine ‘disinformation’ of the state. The biggest purveyors of disinformation are the MSM. There are countless examples of fake stories created by the MSM to support state narratives. Recently, thanks to the work of independent researchers, ‘alternative’ media outlets, citizen journalists and bloggers the scale of state disinformation has become abundantly clear. The Integrity Initiative is a UK state funded propaganda operation whose proven purpose is to disseminate disinformation. Just as Mi6 fed stories to Telegraph journalist Con Coughlin, who broke the Iraqi ‘WMD in 45 minutes’ story, selling the idea of an illegal war that killed millions, so the Integrity Initiative feeds disinformation to its MSM operatives (or clusters) who then report it to you as if it were genuine news. The Internet enables people to discover these falsehoods and then share what they have found with each other. They aren’t Russian trolls of agents for a foreign power. They are predominantly ordinary British citizens. Millions are now aware that the MSM is infested with state disinformation agents. It isn’t that people don’t want a thriving ‘free and open’ mainstream media. They desperately need the press to function properly, free from state interference. Unfortunately it doesn’t. The few remaining decent journalists are being squeezed out of the MSM. If people want to read, listen to or watch real investigative journalism then they have to go to the alternative media. It is almost completely absent form the MSM. The alternative media has grown exponentially as a reaction to the appalling levels of state, and their corporate ‘stakeholder’ partner’s, manipulation of the MSM. Rather than simply accept what they are told, more and more people can use the Internet to check the facts behind MSM stories. When they do they often discover there are none. What can they do? Pretend they don’t know the MSM are lying? Bury their heads in the sand and blithely go along with whatever BS the state comes up with next? The Online Harms White Paper is the state’s response. This is a massive problem for it and it is desperate to silence everyone who insists on asking it questions. So its last remaining option is to completely shut down free speech and the open and free sharing of information. That is exactly what this proposed legislation is going to do. The MSM has also suffered massively as a result. People see they are little more than state propagandists and have stopped buying their pap. MSM reach and sales fell off a cliff and the state saw its propaganda machine collapse. It wants it back. Note the way the language is used to deceive. Of course everyone values the ability to freely and peacefully engage in public discourse. However, our society is not built upon confidence in public institutions. Our society is based upon our constitutional rights not our belief, or trust, in the state. In fact, our constitutional rights exist to protect us from the worst excesses of the state. These rights are being utterly ignored by the state with this pernicious legislation. It is attempting to obliterate our constitution. Where to start? All of these listed state narratives are controversial. There is a wealth of evidence which raises questions about each of them. These are based upon corroborated facts, not disinformation. For example, it is a fact that the British state slapped a ‘D-notice’ on the MSM stopping them reporting the relationship between Sergei Skripal and his ‘former’ Mi6 handler Pablo Miller. It is a fact that Pablo Miller worked with Orbis Business Intelligence, a private intelligence outfit run by Christopher Steel. It is a fact that Christopher Steel wrote the infamous Trump ‘golden showers’ dossier, alleging the Trump campaigns collusion with the Russian state. It is a fact that The Mueller Investigation could find no evidence at all to substantiate any of these claims of Russian collusion. It is a fact that senior BBC news editor Mark Urban personally knew both Sergei Skripal and Pablo Miller. It is a fact that Mark Urban did not disclose this relationship to the public when he was reporting the ‘news’ concerning the Skripal affair. This does not necessarily imply that the conclusions drawn from those facts are all accurate, but nor does it mean they weren’t. Many will have probably jumped to the wrong conclusions, but many won’t. Perhaps the state’s narratives are all 100% accurate and everyone else is wrong. But probably not. It is in the public interest to know about these facts. It is also reasonable to question why the state wanted to hide the facts about the Skripal affair. The state was able to silence the MSM from reporting any of these facts because the MSM is state controlled in the UK. The state was not able to stop independent journalists and British citizens from reporting these facts. The Online Harms White Paper has been proposed to give the state absolute authority over all information and stop the reporting of facts they don’t want you to know about. Any claim by the state that they support a ‘free and independent media’ is preposterous. We already have a growing independent media, rapidly expanding because of the Internet. They do report on things like Sergei Skripal’s relationship network. They do hold the state to account and do ask uncomfortable questions of those in power. The state is doing everything it can to shut down the ‘free and independent media’ and return control into the hands of its compliant, corporate owned, MSM outlets. In a free and open democracy, which we are told we live in, the people have the right to ask questions of the state. If not then the state is, by definition, a dictatorship. The Online Harms White Paper is designed to stop people asking questions and exploring evidence. If we allow the state to dictate what does and does not constitute ‘disinformation’ then all we have left is Newspeak. I avoid prophecy because I’m invariably rubbish at it. However, if you believe this control grid won’t eventually apply to all public discourse you are deluding yourself. Please do not be deceived. This spells out, in no uncertain terms, the states intention to silence all criticism. That the state is referencing the harm principle established by Mill is a travesty. Mill was clear that there was a clear distinction between causing offence, saying something other people don’t like, and actively inciting people to cause real physical harm. This legislation is a 180 deg inversion of Mill’s harm principle. Hate speech legislation is just one example of how the state has persistently sought to introduce the idea that being offended, which is completely subjective, is an acceptable basis to silence critics in law. The state is telling you that you MUST trust everything it says. If you don’t you are confused and have been illegitimately manipulated. The state will ‘make sure’ you are clear about the truth. Any who suggest anything contrary to the states narrative will be silenced, and if they won’t shut up, punished. Identified Harm: Online Abuse of Public Figures. Now we see how this system, designed to stop anyone asking the political elite questions they don’t want to answer, will work. By creating a new law the signalled intention is very clear. ‘Intimidatory’ content eh? So repeatedly asking questions, by writing awkward blog posts for example, or sharing them online (which the EU copyright directive makes impossible anyway), that state official and politicians don’t want to answer, will be considered a crime. Committing crimes often result in imprisonment. I assume what I am writing now will be deemed ‘intimidatory content.’ I guess I, and millions of others, will be forced to stop ‘intimidating’ the establishment. Funny really, because if anyone should feel intimidated by this tyrannical legislation it is not the representatives of the state. It’s you. ‘Unacceptable to whom?’ Of course people should never threaten anyone with violence, defame, slander or libel others. Again that is why we already have laws to stop people doing it. However, the values underpinning democracy, which actually means government by Trial by Jury, are freedom of speech and expression; the ability to question power without fear of repercussion; the Rule of Law and power of the people over and above the state. The suggestion that the Online Harms White Paper supports any of these values is ludicrous. It smashes democratic principles to pieces. Now we start getting into the nuts and bolts of what the state considers to be verboten. Just be aware this is only the initial list. The state can decide to add whatever it likes at anytime in the future. None of these terms are defined. It is all open to interpretation by the state. Extremist content can mean anything the state disagrees with or wishes to be silenced. We have laws to stop incitement so ‘coercive behaviour’ doesn’t mean the common law crime of incitement. It means something else, which the state will determine as and when required. Under the guise of pretending to care about our personal data ‘protections’ the state are giving themselves the legal authority to view absolutely every single piece of personal information you have ever put online. They are not protecting your personal data, they are seizing it. Because global problems prompt global reactions requiring global solutions. Note that this unspecified concept of harm is considered just as much of a threat to the state as illegal activity. We are all prone to exaggeration and over reaction at times. I am no exception. There is a 12 week consultation period and my hope is those who read this will highlight the truly tyrannical nature of the Online Harms White Paper to their MP and implore them vote against it’s passage into law. But honestly, the prospects are not good. This is the state attacking democracy. Based upon the Brexit deception, as we move towards a ‘government of unity,‘ the state is becoming a single entity and political choice is being eroded. It is not an over reaction to suspect we are seeing the creation of a genuine dictatorship in the UK. This legislative proposal is dictatorial. There is no other legitimate way of viewing it. Again I am compelled to stray into prediction, but it needs to be said. What we will witness over the next few weeks will be a never ending stream of MSM articles and news coverage which will be centrally coordinated to sell you the idea that this legislation is a good thing. The uniform narrative will be that it is all necessary to keep you and your children safe. The majority of MSM sales copy will tell you that the Online Harms White Paper proposal is vital to combat the scourge of ‘fake news.’ It will try to convince you that, as an independent sovereign human being, you are incapable of telling the difference between fact and fiction. Therefore the state must do it for you. It is crucial that you cling to and defend a vital, universal human right. You, and everyone else who cares about freedom of speech, are going to have to use every peaceful and lawful means at your disposal, while they still exist, to fight to maintain it. Because the state is intent upon ignoring your rights. As long as you don’t cause legitimate harm, no one, not me, not the MSM and certainly not the state, has any right whatsoever to tell you what to think or to stop you freely expressing your views. This is your right. You were borne with it and the state has no authority to take it away from you. Their only power is to refuse to respect it and that is precisely what the Online Harms White Paper does.